Toyota 1KD-FTV (or 3.0 D-4D engine) appeared in 2000. The engine was available first for the Toyota 120-Series LandCruiser Prado and later for the 150-Series. Also, this 3.0-liter diesel was offered for installation in the Toyota Mk.7 Hilux, Toyota Mk.5 HiAce, and Toyota Hilux Surf (Toyota 4Runner). The 1KD engines ousted the Toyota KZ engine series. But now the 3.0-liter version is rapidly being replaced by the new Toyota GD engine – the 2.8L 1GD-FTV. The 1KD-FTV engine has a cast iron cylinder block with two counter-rotating balance shafts driven by a gear on a crankshaft. The engine block doesn’t have liners. Inside the cylinder block, there is a forged crankshaft with eight weights and five main journals. The crankshaft pulley has a torsional rubber damper to reduce noise and vibration. Also, the engine was equipped with the high-strength connecting rods and aluminum alloy pistons with resin-coated skirts. The pistons are cooled and lubricated with motor oil sprayed by oil jets at the bottom of the engine block. The aluminum 16-valve DOHC cylinder head is mounted on top of the engine block. There is a steel-laminate type head gasket between them. The engine has a timing belt for driving the intake camshaft only. The intake camshaft drives the exhaust camshaft by a gear. Camshafts are covered by a plastic head cover. As was noted earlier, the head has 16 valves or four valves per cylinder (two intake and two exhaust valves). Valves are actuated by the shim-less valve solid lifters/tappets (the adjustment requires replacement them by new). The intake valve diameter is a 32.2 mm; the exhaust valve diameter is a 27.8 mm. When the engine is cold, the valve clearance for the intake valves must be a 0.2-0.3 mm; for the exhaust valves - 0.35-0.45 mm. The 1KD engine is equipped with the ‘Direct Injection 4-Stroke Common Rail Diesel Engine System’ or Toyota’s D-4D. The Common Rail system is an electronically controlled direct fuel injection system for diesel engines. The common-rail pressure ranges from 30 to 160 MPa for the 1KD-FTV engine. The fuel is injected into the cylinders by the eight-hole type injectors. 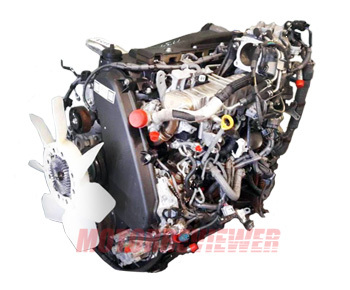 The air for 3.0 D-4D engine is supplied by a variable geometry turbocharger Toyota CT16V. The max boost is 16 Psi (1.1 Bar). The compressed air before the intake manifold goes into the air-to-air type intercooler mounted on top of the engine. All engines have an oxidation catalytic converter lowered the emissions. Started from Euro 3 versions (European emission standard), the engines were equipped with water-cooled EGR system (exhaust gas recirculation). The Euro IV engine versions had the serious problem with cracked pistons. It usually happens between 60-100k miles (100-150k km). That problem is characterized by the presence of black smoke, strong knocking noise, high crankcase pressure and loss of power. The problem was solved by installing reshaped pistons and new oil jets in 2014. The injectors are another source of problems. Copper seats under the common rail injectors can fail. That issue is common for late 2004-2007 model years. The main symptom is a white smoke from the exhaust. Also, there is a problem with injectors itself. The common rail system is sensitive to fuel quality. But even with high-quality fuel, the injectors can fail around 80,000 miles (120,000 km). The engine suffered from failed injectors has a rough idle, high fuel consumption and loud knocking noise at cold. The Toyota 3.0 D-4D engine can reach a 250,000 miles (400,000 km) mileage. The 1KD-FTV is not very durable and reliable compare to the old Toyota’s diesel engines, but we can point out that the 1KD engine is more powerful and at the same time consumes less fuel than its predecessor, the 1KZ engine.